Wallpaper is graphic patterns and gorgeous prints can instantly update your rooms and infuse them with some serious style. Makeover your walls in less than a weekend by creating an accent wall with our easy-to-follow 11-step wallpaper hanging guide. The quickest and usually the most inexpensive way to really change up the feel of a room is to switch up the surroundings. With all of the new styles and wallpaper patterns to choose from, this once-dated décor trend has been resurrected and is totally modern. If you’re not ready to commit to wallpapering an entire room, creating an accent wall by covering only one wall is a great way to add style and interest. 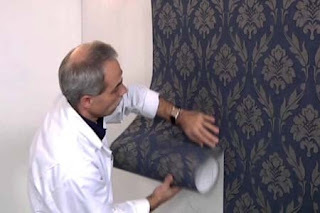 If you think that hanging wallpaper is a messy, complicated process, you’re right—it can be. However we’ve figured it all out, and with a few tips from the pros, we’ve created a simple 10-step guide on how to hang wallpaper. Before you do anything, measure your walls to determine how much wall paper you will need. Once you’ve chosen a style you like and bought your rolls, you’re ready to get started. First, make sure your walls are clean, and have been coated with a wallpaper primer. A coat of primer applied with a paint roller, will help the paper adhere to the wall, and make it easier to remove if needed. Let the primer base dry, and then move on to the next step. If you are using a solid color, you can skip this step. If your wallpaper has any sort of pattern on it (stripes, plaid, etc.) lay two rolls side-by-side and line up the patterns. Then, on one sheet, mark where you want the bottom of the pattern to lie, and measure about four inches down from that point to give yourself a little wiggle room. Using a straight edge (we used a t-square, but you can use the carpenter’s level again), draw a line across the width of the paper, and carefully trim along this line. Repeat this process with your other rolls of wallpaper. Starting at the bottom of the roll you just trimmed off, roll out the rest of the paper and measure out the height of the wall. Using a straight edge, cut the paper horizontally along this point. Make a mark on the back of the paper letting you know which end is the top, and which is the bottom. Repeat this process with your other rolls of wallpaper. Lay out your strips of wallpaper on a long table, or on the floor, with the backside facing up. If your paper is not pre-pasted, apply wallpaper paste over the entire surface. If it is pre-pasted, use a damp sponge to moisten the entire back surface. Using pre-pasted paper is definitely easier, so if possible, choose this type of paper. With the paper still moist, pick up one edge of the paper and fold it over to the center, without creasing the paper. Do the same thing with the other edge. You should not be able to see the back of paper. Don’t worry; it will be easy to separate later. Fold the paper in half again, and another time if necessary taking care not to create any sharp creases—this process is called “booking.” Let your “books” sit for about 5 to 7 minutes. This allows the adhesives to take effect, and for the paper’s width to expand to its original size. You may want to do this in stages so the booked paper doesn’t sit for too long while you’re hanging other strips, and then loose its stickiness. Starting at the ceiling, unfold the top half of one of your strips and stick it to the wall, lining up the side of the paper with your center plumb line. Gently smooth the strip against the wall using a smoothing tool or 6-inch plastic putty knife. Unfold the bottom half of the paper and smooth it against the wall. There should be about four inches of excess paper hanging off the bottom. We’ll get rid of this later. Hold a six-inch putty knife against the bottom of the wall or along a baseboard, and using the utility knife, cut away the excess paper. If you’ve placed wallpaper over a power outlet, turn off all power to the room before trimming around any electrical sources. Using a sharp utility knife, gently cut an “X” shape over the outlet, and use a pair of scissors to cut away the paper. Sweep a clean, slightly damp sponge over the paper to get rid of any extra adhesive, and to remove any air bubbles that may have popped up. Work from the ceiling down, and from the center outward.